As the countdown for Christmas begins we can’t help but think about cosey nights at home watching a Christmas film, putting on your Christmas PJ’s, snuggling into bed and waiting for Santa! 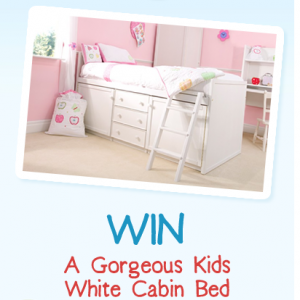 As Christmas is a time for giving, we thought it would be great to giveaway one of our beautiful Children’s Cabin beds for your little one to snuggle down into next Christmas. All you have to do to win is head over to our Facebook page, like our page click the link and enter your details. The competition ends in January so be sure to enter before time runs out! Our cabin bed is a perfect addition to any bedroom. With ample storage space and the extra height this bed is perfect for kid’s bedrooms to provide a play space as well as being super practical. Painted white, not only does this bed look stylish it will also fit the décor of any bedroom. All of our furniture is made to order by our experienced crafts men in the UK – meaning that we really do take quality seriously in our work. Our beds have been known to last for decades and passed through generations. This bed is one of the most popular beds in our range, with three drawers and two cupboards there is ample storage capability. The extra height also means that it is great for space saving in smaller bedrooms, but will also be a stand out feature in any decor. The height on this bed is loved by kids. The winner will be announced in January! Make sure you enter your details to be in with a chance of winning.